Brady's laboratory labels are ideal identification solutions for the biotechnology, agricultural, environmental and forensic research industry. These lab labels are designed to "match" existing vial, slide, and well plate sizes, and they hold up under tissue processing protocols and other extreme conditions. Brady's laboratory labels are clearly readable by anyone in your lab, and allow for easy bar coding and scanning - which drastically reduces errors. B-461 can be offered in a self-laminating format which has a white thermal printable zone and a clear overlaminating area. B-461 has good print smudge resistance, solvent resistance, good high and low temperature performance. B-461 performs well in common laboratory environments such as liquid nitrogen and autoclave applications. Used for laboratory identification such as vials, centrifuge tubes, test tubes, straws, and slides Print Technology: Thermal transfer Material Type: Clear polyester Finish: Clear film with matte white printable zone coated ink Adhesive: Permanent acrylic RECOMMENDED RIBBONS: Brady Series R4300, Brady Series R4500 (colors - red, blue, green), Brady Series R6200 (alternate)*, *B-461 can be printed with Series R6200 ribbon; please note that testing described in this TDS was performed on materials printed with the R4300 Series ribbon. 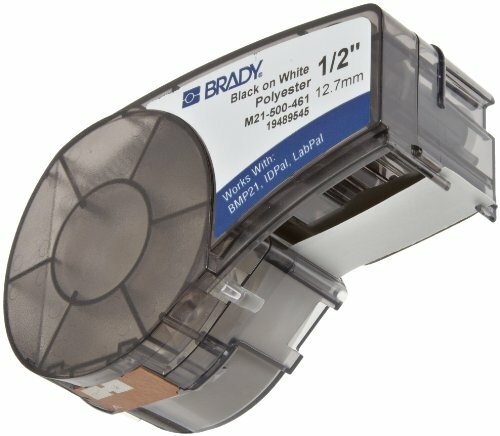 REGULATORY/AGENCY APPROVALS: Brady B-461 is RoHS compliant to 2005/618/EC MCV amendment to RoHS Directive 2002/95/EC.